The EURGBP pair has been range bound between 0.8780 and 0.8930 for the past four months. 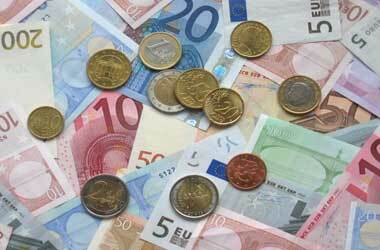 The recovery in the Euro zone economy keeps the Euro bullish. Likewise, the successful completion of the first round of Brexit talks turned the market’s sentiment bullish towards the Pound. Further, several analysts have stated that the Pound remains fundamentally undervalued against the Euro. Analysts at Danske Bank have recently said “GBP is significantly undervalued according to our MEVA model, indicating GBP strength over the medium term.” However, the recent statements issued by Brexit negotiators on either side of the English channel indicate the UK will face a tough time in finalizing a deal before 2019. Further, the manufacturing PMI data reported last week indicate the Euro will have an upper hand against the Pound this week. Referring to the statement, the UK’s negotiator David Davis warned the next round of negotiations will be a roller coaster ride as the first one. Referring to Barnier’s statement, Davis said the European Union cannot “cherry pick” the terms of a free trade deal. He further said Britain needs “full sweep of economic cooperation.” The statement from both negotiators indicate a tough second round Brexit negotiation ahead. On the economic front, the Euro zone continues to march ahead of both the UK and US for the first time since 2007/08 economic crisis. In the latest economic data released by IHS Markit, the Euro zone manufacturing PMI (Purchasing Managers’ Index) reading in December hit 60.6, in line with analysts’ estimates. It is the highest recorded level since mid-1997. The reading also confirmed the previous flash estimates, which indicated the sector had performed exceptionally in 2017. 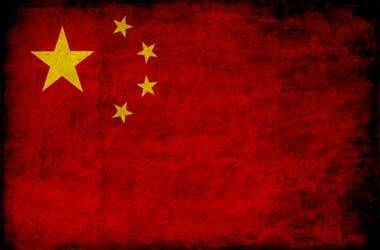 The region-level data pointed to a broad-based growth across the continent. Likewise, the services PMI index recorded a reading of 56.6 in December, the highest level in six years. Analysts had expected a reading of 56.5. In November, the services sector recorded a reading of 56.2, which was later revised to 56.5. The Euro zone unemployment rate has declined to 8.8%, from 12.1% in the first half of 2013. In the UK, according to IHS Markit, the manufacturing PMI declined to 56.3 in December, from 58.2 in the earlier month. Analysts had anticipated a reading of at least 58. Concerns over Brexit and high import costs have led to a decline in the construction activities as well. The industry’s optimism has fallen to its lowest in five years over Brexit fears. The construction PMI reading fell to 52.2 in December, from 53.1 in the prior month. It was worse than economists’ forecasts of 53.1. 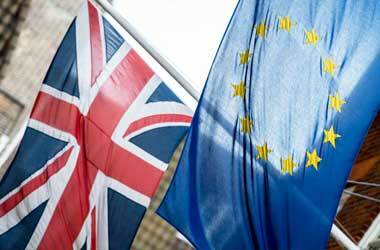 Thus, political developments and economic data support a rally in the EURGBP pair. 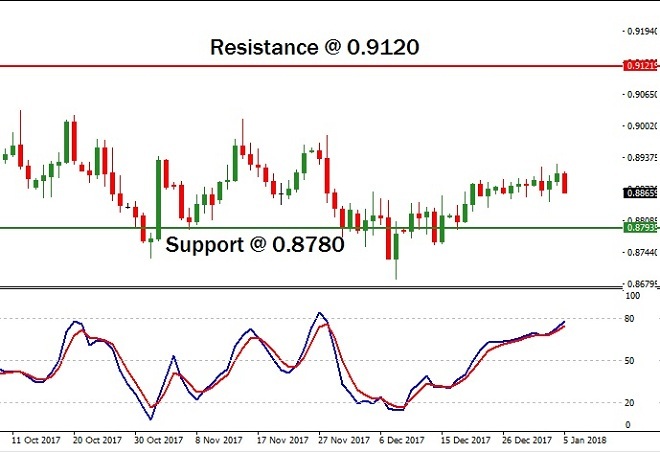 The EURGBP pair is climbing after testing the support level of 0.8780. The stochastic oscillator is rising towards the bullish zone. Thus, we can expect the uptrend to continue in the days ahead. 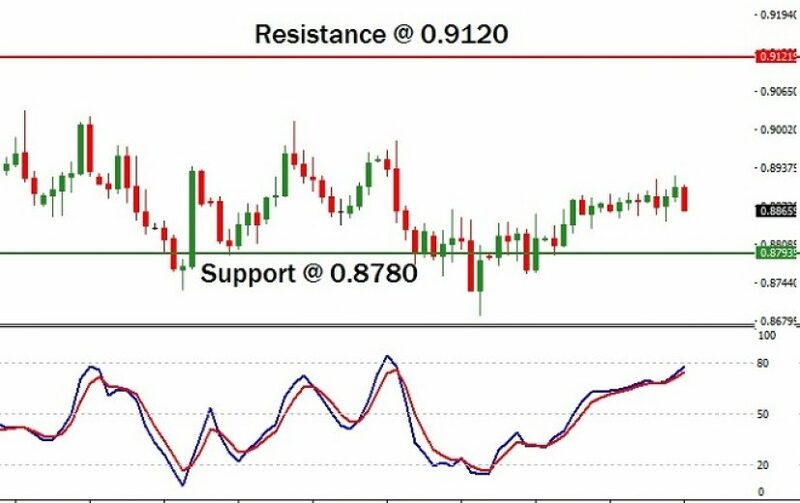 In order to gain from the uptrend, I wish to open a long position in the EURGBP pair, near 0.8840, with a stop loss order below 0.8720. Simultaneously, I will also place a sell order near 0.9120 where the next major resistance is seen in the price chart. Additionally, I am also planning to invest in a call option as long as the EURGBP pair is trading near 0.8840. Further, the option contract offered by the binary broker should be valid for a period of seven trading days.